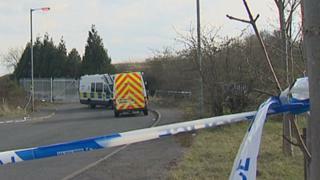 Human remains have been unearthed by workmen at an industrial site in Cambuslang, South Lanarkshire. Police said the remains were found at Dale Avenue, off Bogelshole Road, close to the River Clyde, on Tuesday. The location, behind the former Hoover factory, has been cordoned off while forensic teams carry out a search of the area and further examine the body. Officers are trying to establish the identity of the person and the circumstances surrounding their death.